My favorite mango, by far, is the one called Ataulfo in Mexico. It also goes by the name of champagne or honey mango in other countries. When ripe, its meat is intensely golden yellow with a nice thick bite. It is juicy and has a lightly tart, yet intense, sweetness that is hard not to love. Different from other mangoes, it is not fibrous at all. Being obsessed with words and names, I did a bit of research on the origin of the name Ataulfo, as it doesn’t mean or translate to anything. Well, it turns out that Ataulfo is a name. The Ataulfo mango was first discovered and historically recorded on a man named Ataulfo Morales’ property in the town of Tapachula in the southeastern tropical state of Chiapas. The story goes that, in the late 1940s, he found a few of these fruits and became smitten with how sweet and succulent they are. Now, there were other mangoes in Mexico, brought by the Spanish through their trade with the East when Mexico was a colony of Spain. Yet, it seems that the Ataulfo came to be from a natural mutation or hybridization process. A decade after it was found on Ataulfo Morales’ property, an agronomist named Hector Cano Flores helped popularize it by growing a large quantity of the Atauflo mango trees. And then, another decade later, the first commercial project took place. By the 1970s, when yours truly was born, this mango had extended its reach well beyond the state of Chiapas and was being consumed in Mexico City, where I lived. Still, Chiapas remains the main producer and the biggest exporter of the fruit, and it also has a denomination of origin, just like champagne! Oh how we loved Ataulfos. Me and my sisters used to eat them in so many ways. We’d have them in fruit salads, or we’d eat the sides sliced and covered in thick and creamy rompope – Mexican style eggnog – or garnished with lime, salt and ground chile. But, the most frequent way was just stuck on a special mango fork, peeled and gobbled up. Did you know there is a special kind of fork just for mangoes? It is long and shaped like a trident. The two outer prongs are short and help hold the mango meat in place, while the middle prong is much longer and meant to go through the seed to hold the mango steady. When I was a teenager, I became a fan of fruit tarts. I had found a recipe for a light and elegant fruit tart in one of my mom’s Austrian cookbooks – that she inherited from her mother – and made it my showpiece. Whenever I needed to bring something to a dinner or a party, the fruit tart would come. I had mastered it! However, the recipe, of course, didn’t have mango. And I felt like the fruit that needed to be in there the most was the glorious Ataulfo mango. So, I started adding it in addition to the grapes, bananas and kiwis. Slowly, but surely, the mango started taking over. 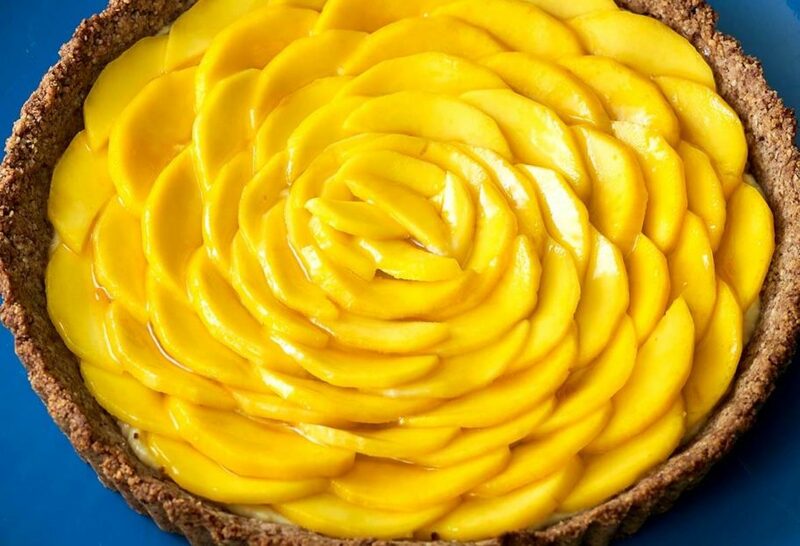 Until finally, a few years ago, I decided to make a full-fledged mango tart. Why pretend that it was a fruit tart when the only fruit I wanted in there was mango? I could stop coveting the mango pieces from other people’s slices. While I was at it, I also decided to make the crust entirely pecan. Of course, the traditional pastry cream stays right in the middle of the two. Oh how I love this tart. It merely does justice to its crown, the Ataulfo mango from Chiapas. Followed recipe for pastry cream exactly, but it’s still liquid? I thought it would be more of a pudding consistency, that way the mango slices will sit on top, instead of sink. Hm, I don’t know why your pastry cream did not thicken, Lauryn. I have made this recipe so so so many times! Do you want to try it again? For sure! Enjoy the tart, Joanne. This is my kind of eye candy! Planning on making this for Easter tomorrow, but can’t seem to locate the tart pan size. Perhaps 9 inch? Thanks for the beautifully inspirational photo! I hope you had a great Easter Jacque! A 9 or 10 inch pan will work great. All the way from South Australia. I love your recipes. Mangoes are in season at the moment in Australia and it is very hot so this will be the perfect dessert to take to many celebrations. I was also thinking of making it in a slice tin to take to the river. When we go wTer skiing and it would be easier to share with everyone. Oh how nice, it would be great eating by the river or skiing! This tart is a work of art! I will definitely be making this. Mangoes are my favorite fruit! Thank you Pati for bringing only the best to our tables. I have Celiac Disease so need to be gluten free, and I am Diabetic. I was wondering if you have any suggestions on how to modify this recipe to meet my needs? Thanks for any he!p you can give me. ​You can substitute the all purpose flour with rice flour or any gluten free flour that you like. It will hold up! Instead of the wine what else can I use? And can I use regular mangoes? If you can’t find atauflo mangoes, you can use what is available. And substitute the wine for water in the glaze. This is also a perfect snack for hot days ;). everyone’s eyes glued to the Mango tart. Thank you Patti for sharing. Love it. Yes it’s perfect for a potluck! What does that mean to slice the cheek of the mango? The cheeks are the sides of the mango that you cut away from the seed. Hola Pati, veo tu programa siempre que puedo, podrias poner estas recetas en español tambien? hablo ingles pero para hacer cualquier cosa en la cocina me es mas facil con las instrucciones en español. Eduardo, en un par de meses vamos a tener el sitio con todas las recetas en español….!!! What an amazing comment…thank you Francine, it means so much to me! Thank you so much for the History & this Wonderful recipe. We will definitely attempt to replicate this weekend, chacho. Cannot wait to try this. I have several mangos in the refrigerator, and was just going to use them in a smoothie. But this seems a great way to use them. Thank you. This sounds wonderful and is something I know my wife of 62 years would have loved. I think I will make it and ask my neighbors over for dessert. You have done just a wonderful job since I first found you many years ago and I thank you for all the wonderful visits we have on the tv. It’s a wonderful dessert to share with your neighbors. Thank you for a great recipe! I can’t wait to try making it. Let me know how it goes Natalia. I love tart of mangoes! Thank you Pati. The recipe looks and sounds yummy! Love your show on TV. Thank you Donna and Harvey! This is beautiful. Your tart looks like a flower! I can wait to make; my mouth is already watering. Thx again for a wonderful recipe and interesting read! Great recipes just love ❤️ how easy Pati makes everything ? I’m not a wine drinker so never have wine in my home. What can I use as a replacement? You can substitute with water. enjoy your recipes, tart looks great will try it. I have enjoyed your show also. Try it and let me know how it turns out Esther!